Quality Business magnet cards provide customers with a free magnet for them to keep. 3.5x2" discount magnetic business cards are perfect to use as promotional items. Magnetic business card printing is a low cost advertising method for any business, letting people remember you whenever they want or need anything. These magnetic business cards are an easy, cost-effective and long lasting promotional item. Be sure to check out our business card printing to help promote your business and services. 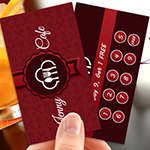 Full color 3.5x2"restaurant magnet business card printing will grip the customer's attention as long as it is stuck to the metal surfaces. 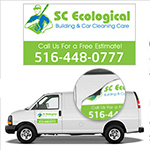 We provide car magnet sign printing that will turn your car into a moving advertisement to gain the attention of many potential clients. Our online printing company provides excellent quality material for magnetic cards that lasts for a long time. 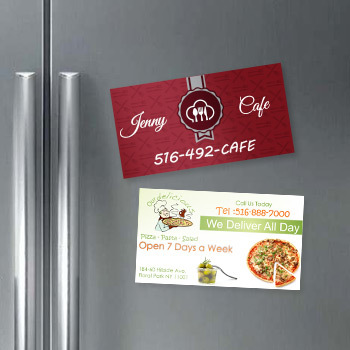 Magnetic business cards are a great way to keep your company on the top of your customer's mind. The front is printed in the 4 color process as in 4/4 printing and the magnet remain on the back of the card. As a slightly thicker material, 150gsm gloss business card magnet is more durable and likely to last longer. It has a more refined effect, and with all of our coated stocks hard-edged detail, colors & text appear sharp when printed on 150gsm gloss material. Advertisements can be very expensive, but not with business card magnets. They are very cost efficient because they are easy to make, easy to display and long lasting. Since you already know that you need your contact information and your business name on your card, there are other things you can provide you customer with as well, such as what type of product you are most interested in selling, what the product or products look like, what service you are trying to sell, and how it can help the customer. You can also have a customer service oriented slogan to show that you really care about the customer. 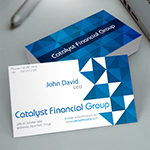 With our design team, we will give you the cutting edge look that is up to date with all professional business cards. We have all the top the design programs including Photoshop, Illustrator, and Coral to make your business card magnet stand out. This is a great way to promote your company. Having magnet cards with you at all times gives you an edge on your competition. This is cheaper then advertising your company in any newspaper, in which your advertisement is only circulating temporarily, or any website, which could get expensive. Business card magnets get the business name and contact information directly into the hands of the potential customer, and most likely onto a surface where it will be seen daily. 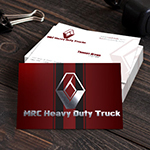 Add contact information to the front side of the magnetic business card and you have got what amounts to a small billboard that keeps your contact information at eye level. Even better, people are more likely to keep business card magnets than they are paper business cards. Once they get home or to the office, people put business card magnets where they can see them. Whether on the refrigerator, the filing cabinet, the copy machine, or the range hood, those small billboards park your business name, phone number, or email address right in front of the customers' eyes. I love the glossy magnets. The surface looks so shiny and long lasting. Good printing and great price! I ordered some magnets from some other printing company but it did not last longer so i tried Printingxpert and they are really cost-effective with excellent material. Happy to receive my magnets early. 4/0 = Full color on front side and on the back side there will be Magnet. Product: Magnet Business card, 3.5" X 2""
Turnaround This is the estimated time your project will be complete after you have approved your proof. Turnaround includes printing and finishing, BUT NOT shipping time. Some products may have more than one turnaround option for expedited service.